Abi Longfellow, 12, was once a happy, outgoing child, whose boundless energy left her parents struggling to make her even sit down. But this all changed two years ago, when a trip to A&E for an innocuous throat infection revealed she was suffering from a rare kidney disease. 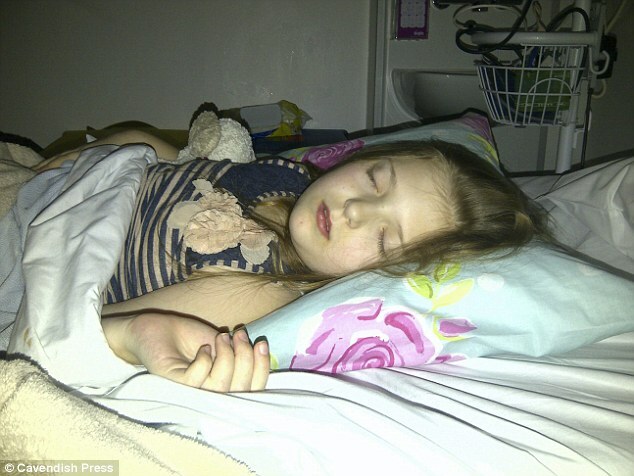 Now she spends her time at home on a dialysis machine for 10 hours everyday - as her parents battle NHS red tape in a bid to save her life. Astonishingly, Abi's illness - known as dense deposit disease (DDD) - is too rare to be covered by the NHS England funding policy, but not rare enough to be considered an exceptional case that would allow access to expensive drugs that could help save her life. 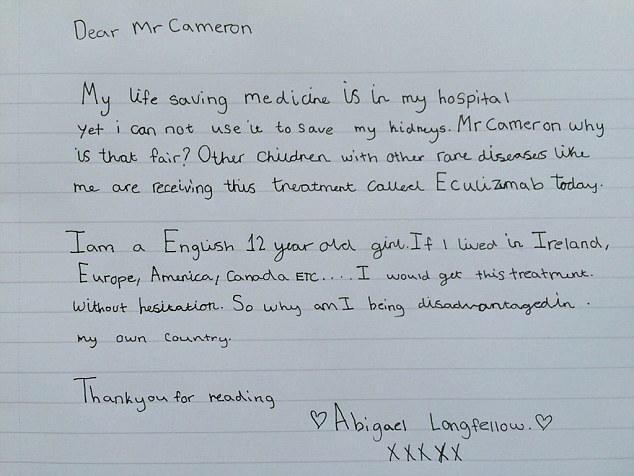 The youngster, from Wakefield, West Yorkshire, has now made an impassioned plea to Prime Minister David Cameron in a bid to have her case funded. Cruelly, some children are given access to the drugs - called Eculizumab - meaning she is forced to go without alongside other children at her hospital who are given the medicine. 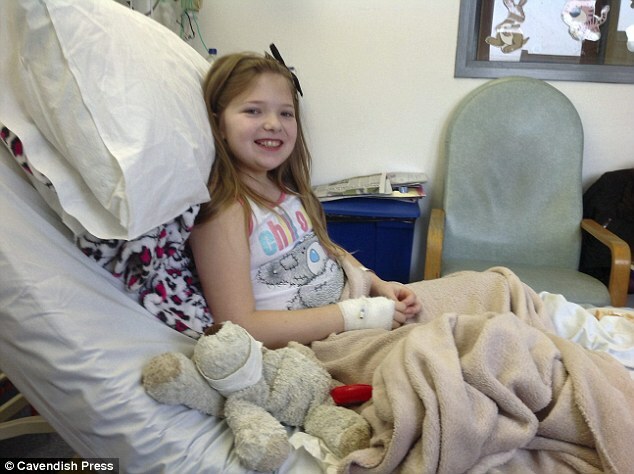 Her illness was first discovered in March 2013, just as Abi, her mother and father were about to depart on a family trip to Florida and the then-10-year-old took a turn for the worse. A trip to A&E that evening was the beginning of every parent's worst nightmare - Abi's symptoms were linked to the latter stages of kidney failure, and she was transferred to a specialised renal ward. By September she had been diagnosed with the rare but aggressive DDD. By December 2013, she was placed on dialysis. She now requires dialysis at home for 10 hours every day - treatment which has an average life expectancy of five to ten years. But the hours spent hooked up to the machine may even increase, Mrs Longfellow said, as she admitted struggling to reconcile her memories of her once-full of life daughter who was now left hooked up to a machine and low on energy. Recently set to receive a kidney transplant from her father Andrew Longfellow, this was cancelled when doctors said she would immediately relapse. 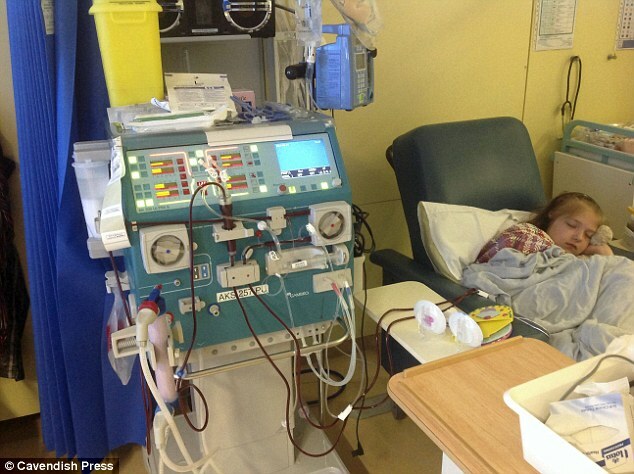 Although an £8,000 injection of the drug Eculizumab every three weeks could prevent this and get her off dialysis, the staggeringly high costs of pursuing the treatment privately have put it out of the family's reach, while a request to have Abi's case covered by the NHS was declined. Mrs Longfellow said: 'The bottom line is it's about costs. But it's also about the policy in place for Abi's disease. The irony is the people that are saying no are the people that write the policy. 'The fact that we've got to fund this ourselves for the initial price of £60,000 is completely outrageous. With no other avenue to turn to, her family now hope to raise $60,000 to start the treatment themselves, proving it will work for Abi and provide a stronger case to request funding. Abi's specialist consultant Eric Finlay told the Sunday People that there were thousands of sick people falling through the cracks of the NHS funding policy. He said: 'I have a one-year-old, a five-year-old and a nine-year-old in my care at the same hospital and I can give them the drug - but when Abi and her family walk in I have to tell them "no". In a cruel set of circumstances, the drug sits in the hospital just metres away from Abi and her family, but Dr Finlay is hamstrung by the NHS red tape. Even if he did slip her the drugs, it would force another of his patients to go without. Dr Finlay said: 'If it is common disease, for instance a heart attack or dementia there is a national policy for these drugs - there is a national funding frame work. 'Then there is Independent Funding Request (IFR) and that is for exceptional circumstances. 'If you are not exceptional but are rare you fall between pillar and post. If it is not exceptional there is no drug funding group and you are in a no man's land. 'I put in an IFR for Abi and NHS rejected it on grounds of evidence, efficacy and cost effectiveness which are reasonable rejections. And a spokesman for Alexion - the producer of Eculizumab, said the company took 'all requests for compassionate use very seriously'.